The results of our personal trainer salary survey are finally in. See what the trainers on this site are really making. If you want to participate in our salary survey, please take two minutes and fill out our personal trainer salary survey form. You can also browse the dozens of comments that trainers have made about earning a living as a personal trainer. 1. How many years have you worked as a personal trainer? 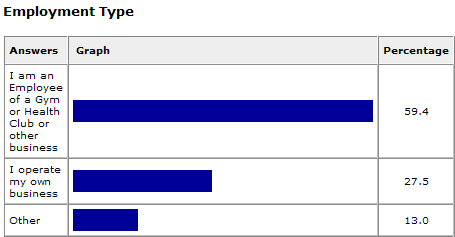 As you can see our survey is heavily skewed toward brand new personal trainers. That is not surprising considering this site caters to people who are just get started as personal trainers. But we need to keep in mind that more than half of the respondents have been personal trainers for less than a year. Given our high number of new personal trainers, it is not surprising to see that the vast majority of them are working as employees. The typical career of a personal trainer starts by working as an employee and then they graduate to running their own business after they gain more experience. Another big influence on our salary rates is the high number of respondents that said they are working part-time. At first glance, this chart is a bit of a shock. But when you consider that 40% of our respondents are working part-time and 70% of them have less than two years experience it starts to make some sense. What is clear is that earning the "big bucks" does not come easy. It takes many years of developing your skills and services as well as strong business sense and customer service. If we eliminate the part-time factor, we see that most entry level personal trainers can expect to earn between $20,000 and $40,000 dollars. That number expands into the $40,000 to $50,000 range with a couple years of experience. 5. How much do you charge the client? This question had a much larger distribution which is likely affected by regional differences. Experience is another factor that affects the outcome. However, offering services for less than $30 per hour is likely selling yourself short. 6. What percentage of the fee do you keep? This question just shows that entry level trainers have an endless range of compensation options. If you aren't happy with your take home pay, negotiate with the gym management. Most gyms will be happy to pay you a percentage for new clients that you bring in (not clients that just happen to walk in). If you deliver the revenue, you should share in the reward. 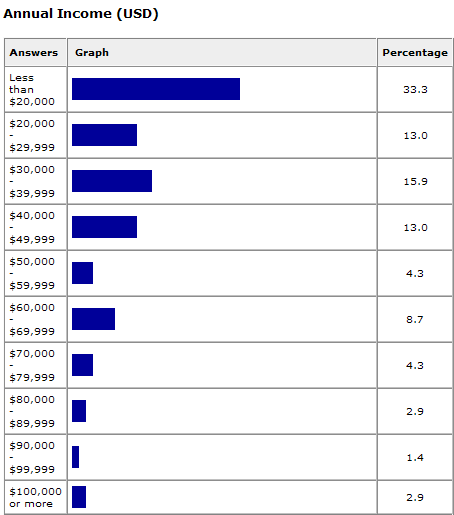 So that is the personal trainer salary survey! We are continuing to collect data so please submit your honest answers. You can also use our contact form to suggest new questions to be included in the survey.